Brothers Keeper "want to show you something deeper. They wish to highlight the aspects -- of friendship, of commitment, of faith -- that make this life worth much more than the surface struggles to reveal. They want you to see -- and hear -- something Beyond Beautiful." 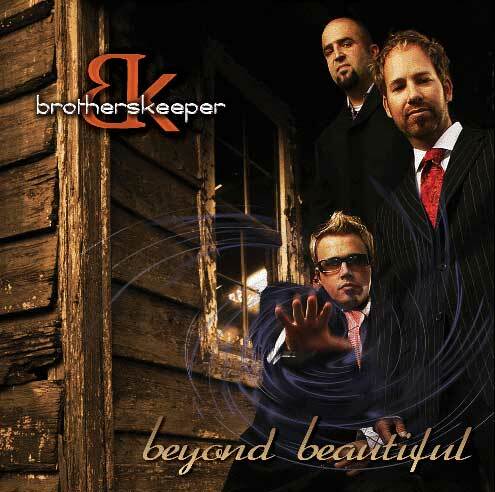 BEYOND BEAUTIFUL is the third album released by this evolving contemporary acoustic pop trio, The Brother's Keeper, which showcases their unique acoustic-based / pop praise and worship sound, coupled with meaningful lyrics, which express spiritual messages which revolve around their stated mission statement posted above. This reviewer found the songs are wonderful to listen to, never over produced and a joy to review. Gary Dunlap describes the music on this album, BEYOND BEAUTIFUL has being "Something you can put in your car and sing along with, maybe it sets the tone for worship, or just a time of reflection. Regardless, we pray our music touches people where they are." I heartily agree with Gary! If you are looking for a wonderful collection of sing out loud praise and worship songs which lift the spirit and feed the soul while praising and worshiping God, then BEYOND BEAUTIFUL is the perfect CD to pop into a player on your computer, in your car, or in your living room. The contemporary ballads and prayer hymns as well as the praise and worship songs would also find a home in any denominational contemporary service, or youth / family camp setting. Working hard with other talented songwriters from 4HIM, Sonicflood, Gaither Vocal Band, Avalon, Newsong, etc., this collective group of talented Christian artists and Brother's Keeper have created together songs which express how beyond beautiful is the Gospel of Jesus Christ and explore what in life is truly beautiful, when it is anchored in Him. Mark Harris (4HIM), Tony Wood, Bob Carlisle, Todd Agnew, Scott Krippayne, Rick Heil (Sonicflood), David Phelps (Gaither Vocal Band) Russ Lee, Michael O'Brien (Newsong), Collier/ Jim Cooper /Regie Hamm, Barton /Richard Page, Mark Harris / Tony Wood, Lindsey, Muckala/Anders and Pike all know how to compose for this talented trio of vocalists, who also gave their input and ideas to add to the creative musical process which results in such spiritually and well written Christian music. John reflects, "For us, putting together the record, it was about putting together messages and songs that moved our hearts and lives and spirits where we were, but can also encourage and motivate people, Christians and non-Christians alike. From a musical standpoint, we want to be able to compete with anything out there, and people can point to it and think, 'Man, that's solid. They didn't cut any corners.' But also, when you get it, there's a positive message." There is never a dull moment musically. The listener is treated to a variety of types of Christian music; Something for everyone! Praise and worship songs, anthems, prayer hymns, a ballad and even a hip-hop / Latin beat inspired song with a touch of rap! The Brother's Keeper have long admired all these Christian music groups mentioned above, but have created their own sound, making these inspiring compositions their own as their evolving style and combined musical gifts bring these songs rousingly to life, offering heartfelt renditions of the songs, sharing their faith and passion for the Lord through the powerful vehicle of musical expression. The main ingredient of the songs which is most impressive to this reviewer has to be the strong, expressive, clear vocals presented with a professional delivery, solid southern Gospel inspired full harmonies in the chorus, great dynamics and breath control, all which are important ingredients to their very contemporary unique form of musical expression. One finds that the vocals package fully express the lyrical messages of "friendship, of commitment of faith in Jesus" in such a delightful manner, that it is no wonder the songs inspire personal thanksgiving and praise to God! 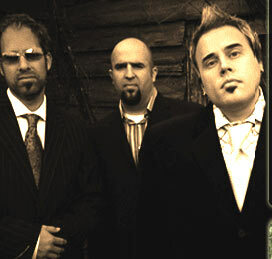 The listener is treated to not only a collection of songs featuring their unique style of performing, but also one is moved by their faith-inspired hearts so evidently expressed in their vocal presentation of the rich lyrics. These talented vocalists with great breath control and musical instincts, all have a passion for Jesus which is evident in their music, as the influence of the Holy Spirit is felt in the combination of the inspiring compositions and the vocals. The Title song, BEYOND BEAUTIFUL is a great example of this. The swelling dynamics, catchy melody, heartfelt vocals, and anthem style, well-composed composition will most likely inspire the listener to sing along with enthusiasm in praise to the Lord. FLYING THROUGH THE CLOUDS - Another really appealing praise and worship rock hymn, a jubilant composition, which praises Jesus for his faithfulness to us. PASSION stands out as a great example as an anthem fueled by personal convictions of Brother's Keeper. Vocals are heartfelt, full of the spirit declaring their dedication to the Lord, with to the wall 3 part harmony sound in the chorus. HE TOOK THE SCARS - A powerfully performed worship piano-based anthem, with plenty of umph, reminding us how Christ died for us because he loves us. CROSS OF CHRIST - A very poignant, moving worship hymn, which touches the heart, and moves the spirit in worship. The second most impressive ingredient of the songs was the pairing of well -written, always interesting musical compositions with meaningful lyrics which express so well the spiritual themes of the songs. RICH IN LOVE - Delightful rhythm, an infectious melody, great lead vocals and 3 part harmony in chorus paired with wonderful lyrics explores the theme that while we are empty vessels, we are filled with the Lord's love and spirit. If it is ever released as a single, this song would be #1 in most song charts! WALK WITH ME - This stately anthem explores what being a Godly man really means, and to pay honor to that idea of Christian brotherhood and accountability. John Sanders commented, "It was great to work with these guys. The fact that these outstanding artists all wanted to contribute their time and talents to this song and were able to coordinate their schedules around it was totally a God thing." SOAP - A unique composition which has a syncopated Latin beat mixed with a dash of hip hop & rap! Makes for a very colorful musical vehicle for a rather clever lyrical message which explains how the blood of Jesus cleanses us from our sin, aimed at the heart of the young. NOAH - An upbeat, irresistible acoustic ballad with a rock beat, featuring the usual great vocals and harmonies tells the story of Noah, with the messages that encourage the listener to be fully open to the Lord's calling, promising that the Lord is always with us and we're never alone, even when the rain is falling down. GIVE IT AWAY - A great example of an upbeat, encouraging acoustic pop/rock song which encourages the believer to share the Gospel, empowered by the Holy Spirit. Everything concerning the music works well together to offer an inspiring listening experience. Lets review why you would enjoy having this CD in your music collection! * The Holy Spirit inspired performances of the wonderful lead vocals, the tight, full harmonic ensemble sound, which together expresses the heart and soul of the message of each song so professionally and effectively. * The inspiring lyrical messages which feed the soul and lift the spirit, putting the listener in the state of worship and praise and being thankful for Jesus in his or her life. * This collection of songs offers a variety of catchy to poignant well written musical compositions, each with a unique melody and rhythm, interesting counter melodies, and embellishments, featuring accomplished accompaniment provided by talented musicians who know their instruments well. * The great use of dynamics in both the vocals and musical compositions. The end result provides the listener with music which gladdens the heart, feeds the soul and uplifts the spirit within; thus blessing the listener. I highly recommend BEYOND BEAUTIFUL for your music collection! It is A MUST BUY for contemporary Christian music lovers! The themes of the songs revolve around Jesus, our relationship with Him and following His will for our lives. Jesus Christ as our Lord and Savior. Jesus as our loving and faithful friend, a source of hope, help, and healing. Jesus as our dependable source of strength and enpowerment, enabling us to do His will. Being in a relationship with Jesus, following Him with commitment and faith. Being accountable to each other in Christian brotherhood and sisterhood through fellowship and friendship with other Christians. * * * + + BEYOND BEAUTIFUL - Title song - Words and Music by Siler/Hamm. This CD begins with a strongly inspiring piano-based, prayer hymn anthem, powered with a light rock beat; a spiritual statement which lyrically and musically introduces the most truly beautiful gift that God has given us; Our Lord and Savior. This love letter to Jesus has a memorable melody, dynamic, interesting to listen to composition, lyrics which so beautifully describe Jesus as a person we worship and glorify. A great mood lifter! The piano and electric guitars and perhaps a touch of synth, offer a dynamic musical support to the melody and the expressive vocals. Chorus: Beyond beautiful, beyond beautiful / You are everything these eyes could hope to see / Beyond beautiful, beyond beautiful / and You’re making something beautiful in me. 2nd favorite of this reviewer. This lively praise and worship rock hymn has all of my favorite elements found in the electric / acoustic / guitar pop rock genre, as it bustles with creativity and spirit of the musicians and the unique talents of the Brother's Keeper. Vocals are stellar, both in lead and chorus. Song features a great melody, inspiring dynamics which build throughout, fine musicianship in both the musical accompaniment and vocals of the band and lead vocals. Song begins with an infectious dotted note & rest rhythm counter melody thanks to a spirited electric/ bass / acoustic ensemble, which establishes a fine musical platform for the expressive lead vocals to sit on top of; all propelled with the spirit of a strong rock beat. The combination of a well composed composition, complete with interesting guitar chromatic slides, riffs and other embellishments, inspiring lead vocals & harmonic chorus work provides a wonderful musical vehicle for the lyrical message which really does uplift the spirit with the hope of what the Lord has promised. You know I could sing your praise for all eternity / And never give thanks enough for all You’ve done for me /You made me a new creation / You lifted me up, it's like I'm .. Chorus: Flying through the clouds / in the big blue sky / and Your Love has got me / Flying through the clouds / I’m off the ground and I won’t look down anymore / Oh no! I won’t look down anymore. (Chorus) Oh no! I won’t look down anymore. * * * + + HE TOOK THE SCARS - Words and Music by Hamm. Fifth favorite song of this reviewer. A glorious poignant piano-based worship hymn which makes good use of acoustic guitar as both rhythm and melody support, nice counter-melody carried by electric guitar, and nice string filler which supports but not overwhelms. Love the dynamic buildup and decrescendo pattern. Lead Vocals and harmonies are most inspiring, and move the spirit within. (Yes, this song does choke me up). * * * + + PASSION - Words and Music by Barton/Paige. Fourth favorite song of this reviewer. Written in a minor key, a full bore, passionate faith statement, which vocally is stunning; both the lead vocals and group harmony. Powerful Vocal presentation is paired with a creative, lovely, dramatic, and intricate combination of synths work, electric guitar, acoustic guitar propelled with a syncopated rhythm. The melody is quite memorable, and the dynamics are very effective. When the Lord fills one with a passion to do a ministry, this song describes the feeling perfectly! It pounds on my heart like a drum / Calling for nothing less than complete surrender / And I can’t make it stop, I wouldn’t try / The truth is in me like a fire / And it burns forever. Everywhere, all the time, oh completely consuming. Chorus: This is my passion / This is what I believe I trust Jesus, the One who died for me / And I am not ashamed / To live it everyday / Faith, hope, love, passion. There are times on this road when I get weak / The world is tempting me to compromise my convictions / But with every fall I get up / You remind me why your love / Is so amazing. Bridge: Every day and every tomorrow I’ll spread the Good News I have no choice but, but to follow And lead others to You. * * * + WALK WITH ME - Words and Music by Harris/Wood. An easy-going, pretty, acoustic anthem giving thanks for fellow Christians who in a brotherhood anchored to Jesus hold one another accountable for life choices and provide a willing ear to listen or a word of encouragement. One notices nicely arranged vocals and harmonies, the usually great dynamics, a strong melody for the meaningful lyrics and a well written composition which supports it all. 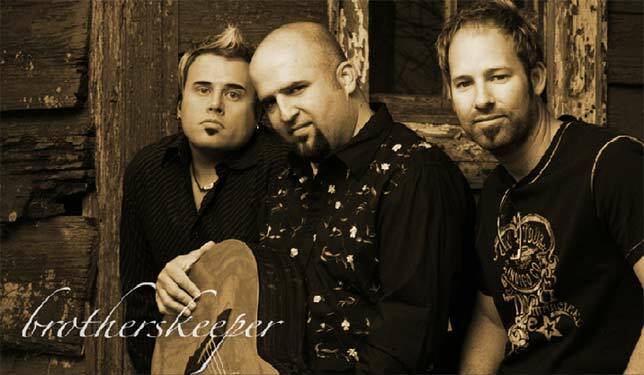 All three Brother's Keeper members take turn singing various phrases of the verses, making this a personal reflection, as they put their heartfelt feelings into these effective vocals - Love the full harmony sound. There are things about me God only knows – and I’d Have to say you guys are next in line – no Matter what I tell you – you don’t Love me less and I’m sure you are the truest friends of mine – on this Narrow road of faith – I don’t Want to be unwise – and Stray into the field of compromise. An upbeat, peppy pop rock, acoustic-electric based guitar ballad with the usual enjoyable qualities found on this CD; an infectious melody, enthusiastic strong lead vocals, wonderful harmonies, interesting musical support of both acoustic and electric guitar ensemble and keyboards. Some nice counter-melodies add sparkle. Most enjoyable listening while being encouraged to show God's love! You’ve got this love / you’ve got this peace and joy inside your heart you know that anyone would hold it close if they were smart but it just keeps sneaking out this feeling’s just too hard to hide you want to tell someone so don’t keep it locked inside. Chorus: Give it away set it free like a beautiful butterfly / Watch and see how far it goes / You won’t know until you try / Give it away it’ll come right back like a bright birthday surprise if you want to see the Love of Jesus living before your eyes give it away. Third favorite song of this reviewer! A very lively, creative song, which is an upbeat confession / prayer hymn, which in its joyful way encourages a look at self and to give thanks and gratitude to the Lord. Love the irresistible rhythm and infectious melody, its joyful spirit and most of all the meaningful lyrics, so enthusiastically expressed by the well done vocals and BK harmonies. The lively introduction gets the song off to an energetic start with an interesting rhythm using dotted eighth/ running 16th / rest pattern played with energy by a synths. keyboard / electric guitars / drums which carries on with umph and cooks mightily along, throughout the song, providing a wonderful, spirited counter-melody as well. Total package will knock out any stress out the window and give the listener a sense of joy as one can't help but sing along with BK! I hope they release this song as a single, as it would be wildly popular with just about everyone! Lyrics: Du du du du du du du dudu! Du du du du du du du dudu! Chorus: We are meek, we are weak / We are empty vessels / Waiting to be filled by our Father above We are small, one and all / But we have mercy on us / We are poor in spirit / But we are rich in love. Hook: Rich in love ... Rich in love... Du du du du du du du dudu! Rich in love... Du du du du du du du dudu! * * * + + CROSS OF CHRIST - Words and Music by Hamm/Lindsey. Favorite song of this reviewer - A wonderful worship anthem which would find a home in just about any Christian service - Contemporary or Traditional. Written in a minor key, which has a 6/8 meter, giving the song a rolling feel. Wonderful synths work with acoustic and electric guitar and keyboards, and orchestra sound skillfully mixed in when the dynamics build. It is amazing what can be accomplished musically using a synths, mixing in orchestra strings, etc. Begins quietly 6/8 metered sythns work, with some expressive sounds, all which provide stunning rhythm and counter-melody which supports the melody, carried by the vocals. Shimmering cymbals mark the beginning of the first verse, the melody carried by strong, poignant lead vocals, with other BK's singing great support harmony, the lyrics in ( ). Composition and vocals together build dynamically into the victorious chorus, which is a spiritual experience, lifting the listener into the spirit of worship and thanksgiving. The combination of composition, vocals and dynamics in the chorus is one of the best I've heard in a long while; very poignant, spiritual and sure to lift the spirit, feed the soul and choke you up if you are sensitive. The song quiets down at the end of the last chorus, and one is treated to acoustic guitar ensemble playing the melody and rhythm established in the beginning, with very light sythns. On Calvary’s mountain Hope was born / God Himself the Sacrifice / He carried sin, it’s grief and scorn / Up on the precious cross of Christ. I have not seen this rugged wood, (Where my Jesus bled and died) / To which my Savior was enticed, (On the cross, the cross of Christ) / But hopeless hearts were changed for good, (Where my Jesus bled and died) / Up on the precious cross of Christ, (On the cross, the cross of Christ). * * * + + Chorus: Oh Blessed Hope, unbounded grace / When all our good would not suffice / He challenged darkness face to face / Up on the precious cross of Christ. There is a joy that’s found within / those who are born not once but twice (On the cross, the cross of Christ) / For they have learned that life begins / Up on the precious cross of Christ (On the cross, the cross of Christ). Hook: He challenged darkness face to face / up on the precious cross of Christ (On the cross, the cross of Christ) / up on the precious cross of Christ / up on the precious cross of Christ! On Calvary’s mountain Hope was born / up on the precious cross of Christ. * * * + SOAP - Words and Music by Muckala/Anders. Another creative, spirited anthem with a syncopated Latin beat mixed with a dash of hip hop & rap, which should get you dancing around the room! Tight moving musical accompaniment is carried beautifully by keyboards, piano, guitars, and drums cooks mightily along, making it sound so easy, driving the tempo forward! Vocal styles are interesting with a touch of soul in parts. Great interplay with various BK voices, again taking turns singing the verses, and chiming in during the chorus. Chorus: What soap / can never wash away / Deodorize or disinfect / The dirty hands of a derelict / What soap / can never wash away / The blood-stained hands of a guilty man / Only Your love can. Bridge: Soap on a rope cause it ain't worth hopin', Soap on a rope cause it ain't worth hopin', Soap on a rope cause it ain't worth hopin', Soap on a rope cause it ain't worth hopin'. * * * + + NOAH - Words and Music by Pike/Hamm. A great song to end the CD. An appealing acoustic-based ballad whose lively spirit, infectious melody and hopeful message is a crowd pleaser for an inter-generational audience, perfect for family camp, Sunday School program, or family / contemporary service. Composition cooks along in a peppy fashion, with energy and umph in the acoustic-driven accompaniment, nicely supported with electric guitar embellishments. Love the lyrics, presented so well by the vocals of BK. The usual great vocals, great diction, great dynamics, and great harmonies. Second verse is my personal favorite. Tag: I want to float like Noah in the ark / I want to float like Noah.